An ink droplet is ejected through a nozzle and travels through air until it hits the target. The model can be used to understand the effect of the ink properties and the pressure profile at the nozzle on the drop velocity, drop volume, and the presence of satellite drops. The Microfluidics Module brings you easily-operated tools for studying microfluidic devices. Important applications include simulations of lab-on-a-chip devices, digital microfluidics, electrokinetic and magnetokinetic devices, and inkjets. The Microfluidics Module includes ready-to-use user interfaces and simulation tools, so called physics interfaces, for single-phase flow, porous media flow, two-phase flow, and transport phenomena. Microfluidic flows occur on length scales that are orders of magnitude smaller than macroscopic flows. Manipulation of fluids at the microscale has a number of advantages – typically microfluidic systems are smaller, operate faster, and require less fluid than their macroscopic equivalents. Energy inputs and outputs are also easier to control (for example, heat generated in a chemical reaction) because the surface-to-area volume ratio of the system is much greater than that of a macroscopic system. In general, as the length scale of the fluid flow is reduced, properties that scale with the surface area of the system become comparatively more important than those that scale with the volume of the flow. This is apparent in the fluid flow itself as the viscous forces, which are generated by shear over the isovelocity surfaces, dominate over the inertial forces. The Reynolds number (Re) that characterizes the ratio of these two forces is typically low, so the flow is usually laminar. In many cases, the creeping (Stokes) flow regime applies (Re«1). Laminar and creeping flows make mixing particularly difficult, so mass transport is often diffusion limited, but even in microfluidic systems diffusion is often a slow process. This has implications for chemical transport within microfluidic systems. The Microfluidics Module is designed specifically for handling momentum, heat, and mass transport with special considerations for fluid flow at the microscale. LAMELLA MIXER: The picture shows flow in a device designed to enhance the mixing of two fluids in a lamella flow. Pressure contours are shown on the walls of the mixer, and the velocity magnitude is shown at the inlets and outlets of the mixer as well as at the point where the two sets of channels (carrying different fluids) converge. Streamlines (in red) are also plotted. The inset shows the concentration of a diffusing species present in only one of the fluids. It is plotted along vertical lines located progressively further down the center of the mixer. ELECTROWETTING LENS: The figure above shows an adjustable focus liquid lens, whose radius of curvature can be adjusted using the electrowetting effect. The colors show the fluid velocity magnitude in a lower, oil-filled part of the lens, while the arrow plot shows the velocity in the liquid above the oil lens. SPLIT AND RECOMBINE MIXER BENCHMARK: This example models a split and recombine mixer channel in which a tracer fluid is introduced and mixed by multi-lamination. Diffusion is removed from the model using an extremely low diffusion coefficient so that any numerical diffusion can be studied in the lamination interfaces. The results compare well with the referenced publication in both the lamination patterns and total pressure drop across the mixer. TWO-PHASE FLOW: When multiple phases are present, surface tension effects become important relative to gravity and inertia at small length scales. The Laplace pressure (the pressure jump across a two-phase boundary), capillary force, and Marangoni forces all scale as 1/Length. The figure below shows the break-up of oil droplets to produce an emulsion as the oil flows into a channel carrying a second fluid. Velocity streamlines are shown and the fluid velocity is plotted on the symmetry plane. The two-phase boundary is shown in green. COMSOL DESKTOP: A complete modeling project from start to finish can be accomplished within the COMSOL Desktop®. The visualization shows a time-dependent single-phase flow study of a microchannel that is used to infuse and flush another piece of equipment with a fluid. ELECTROOSMOTIC MIXER: This particular micromixer takes advantage of electroosmosis to mix fluids. A time-dependent electric field is applied, and the resulting electroosmosis perturbs the flow. A streamline visualization shows extensive folding and stretching of the flow field. 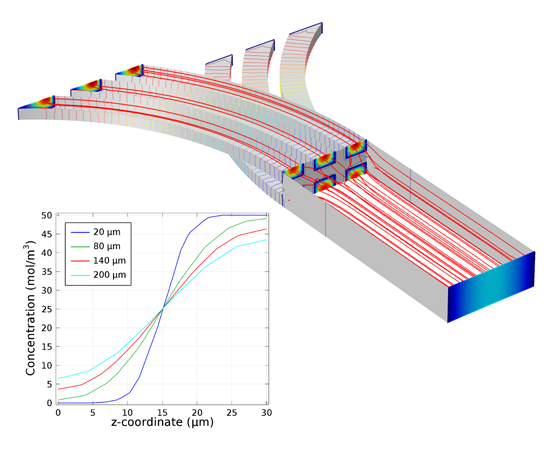 COMSOL’s general-purpose multiphysics features are uniquely suited for handling the many microscale effects that are utilized in microfluidic devices. It is easy to set up coupled electrokinetic and magnetodynamic simulations – including electrophoresis, magnetophoresis, dielectrophoresis, electroosmosis, and electrowetting. In addition, chemical diffusion and reactions for dilute species functionality included in the module enable you to simulate processes occurring in lab-on-a-chip devices. 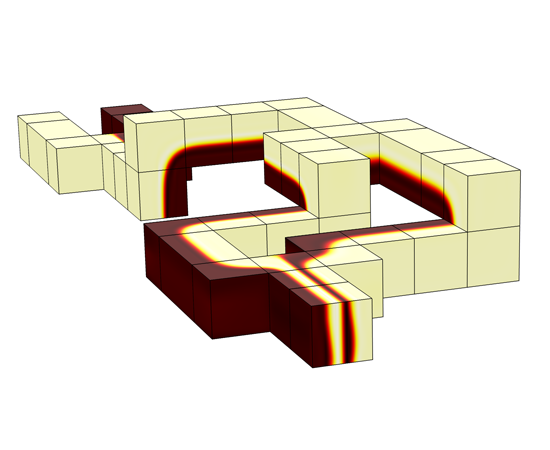 For simulating rarefied gas flows, you can use the specialized boundary conditions that activate flow simulation in the slip flow regime. 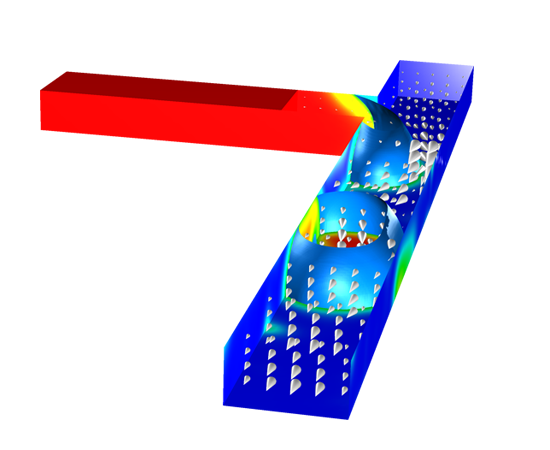 The Microfluidics Module also provides dedicated methods for simulation of two-phase flow with the level set, phase field, and moving mesh methods. For each of these, the capabilities of the Microfluidics Module include surface tension forces, capillary forces, and Marangoni effects. To model a microfluidic device, you begin by defining the geometry in the software by importing a CAD file or via the geometry modeling tools that are built into COMSOL Multiphysics. For importing geometry models, several choices are available to you: the CAD Import Module, for import of mechanical CAD models; the ECAD Import Module for import of electronic layouts; and the LiveLink™ products for CAD for a direct link to models created in a dedicated CAD software package. In the next step, you select appropriate fluid properties and choose a suitable physics interface. Initial conditions and boundary conditions are set up within the interface. Next, you define the mesh. In many cases, COMSOL’s automatically created default mesh, which is produced from physics-dependent defaults, will be appropriate for the problem. A solver is selected, again with defaults appropriate for the relevant physics, and the problem is solved. Finally, you can visualize the results.You access all of these steps from the COMSOL Desktop®. The Microfluidics Module can solve for stationary and time-dependent flows in 2D and 3D, and can be coupled with any other add-on products for further extension of the modeling capabilities. One such example is for tracking particles released in the flow stream, which is made possible by combining with the Particle Tracing Module. The Fluid Flow interfaces use physical quantities, such as pressure and flow rate, and physical properties, like viscosity and density, to define a fluid-flow problem. The physics interface for laminar flow covers incompressible and weakly compressible flows. This Fluid Flow interface also allows for simulation of non-Newtonian fluid flow. A physics interface for creeping flow is used when the Reynolds number is significantly less than 1. This is often referred to as Stokes flow and is appropriate for use when viscous flow is dominant. It is usually applicable to microfluidic devices. Three different methods are available for two-phase flow: level-set, phase-field, and moving mesh methods. These are used to model two fluids separated by a fluid interface and where the moving interface is tracked in detail, including surface curvature and surface tension forces. The level-set and phase-field methods use a fixed background mesh and solve additional equations to track the interface location. The moving mesh method solves the flow equations on a moving mesh with boundary conditions to represent the fluid interface. In this case, additional equations are solved for the mesh deformation by means of the arbitrary Lagrangian-Eulerian (ALE) method. All of these methods and their physics interfaces support both compressible and incompressible laminar flows, where one or both fluids can be non-Newtonian. Rarefied gas flow occurs when the mean free path of the molecules becomes comparable with the length scale of the flow. The Knudsen number, Kn, characterizes the importance of rarefaction effects on the flow. As the gas becomes rarefied (corresponding to increasing Knudsen number), the Knudsen layer, which is present within one mean free path of the wall, begins to have a significant effect on the flow. For Knudsen numbers below 0.01, rarefaction can be neglected and the laminar flow physics interfaces of the Microfluidics Module can be used with non-slip boundary conditions. For slightly rarefied gases (0.01<Kn<0.1), the Knudsen layer can be modeled by appropriate boundary conditions at the walls together with the continuum Navier-Stokes equations in the domain. In this instance, a special Slip Flow physics interface is available in the Microfluidics Module. To model higher Knudsen numbers, the Molecular Flow Module is required. Flow through porous media can also occur on microscale geometries. The flow is often friction-dominated when the pore size is in the micron range and Darcy’s law can be used. The Microfluidics Module features a dedicated physics interface for porous media flow based on Darcy's law. In this case, shear stresses perpendicular to the flow are neglected. For intermediate flows, a physics interface for the Brinkman equations is available. 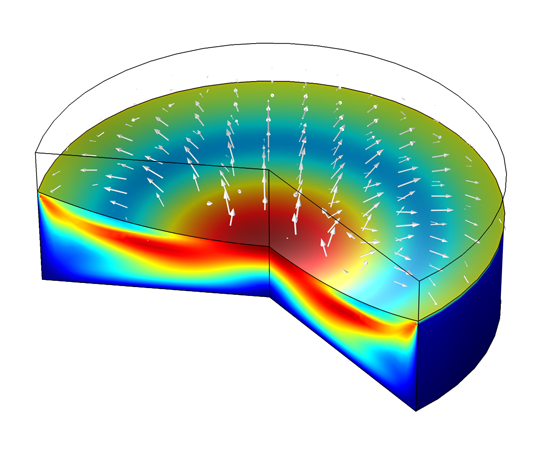 This physics interface models flow through a porous medium where shear stresses cannot be neglected. Both the Stokes-Brinkman formulation, suitable for very low flow velocities, and Forchheimer drag, which is used to account for effects at higher velocities, are supported. The fluid can be either incompressible or compressible, provided that the Mach number is less than 0.3. A special physics interface for free and porous media models, both porous media using the Brinkman equations and laminar flow, automatically providing the coupling between the two. These interfaces are appropriate for microfluidic porous media flow. Example applications include paper microfluidics and transport in biological tissue. At the microscale, a range of electrohydrodynamic effects can be exploited to influence the fluid flow. The Microfluidics Module is an excellent tool for modeling virtually any such effect. The electric field strength for a given applied voltage scales beneficially, making it easier to apply relatively large fields to the fluid with moderate voltages. In electroosmosis, the uncompensated ions in the charged electric double layer (EDL) present on the fluid surfaces are moved by an electric field, causing a net fluid flow. The Microfluidics Module provides a specialized electroosmotic velocity boundary condition as one of several fluid wall boundary conditions. Electrophoretic and dielectrophoretic forces on charged or polarized particles in the fluid can be used to induce particle motion, as can diamagnetic forces in the case of magnetophoresis. The Particle Tracing Module provides ready-to-use electrophoretic and dielectrophoretic particle forces. Combining the Microfluidics Module with the AC/DC Module enables you to model AC dielectrophoresis. The manipulation of contact angles by the electrowetting phenomena is also easy in microscale devices. Electrowetting is a phenomenon that has been exploited as a basis for various new display technologies. The Microfluidics Module allows for direct manipulation of the contact angle with user-defined expressions including voltage parameters. The Microfluidics Module provides a dedicated physics interface for transport of diluted species. It is used to simulate chemical species transport through diffusion, convection (when coupled to fluid flow), and migration in electric fields for mixtures where one component – a solvent – is present in excess (90 mol% or greater). It is typically employed to model the performance of mixers. For modeling chemical reactions in microfluidic devices, you can combine the Microfluidics Module with the Chemical Reaction Engineering Module, which also makes available transport of concentrated species with binary diffusion. You can combine the Microfluidics Module with Microsoft® Excel® via LiveLink™ for Excel®. This LiveLink™ product adds a COMSOL tab and specialized toolbar to the Excel ribbon for controlling the parameters, variables, and mesh, or for running a simulation. It also includes the capability to import and export Excel files for parameter and variable lists in the COMSOL Desktop®. 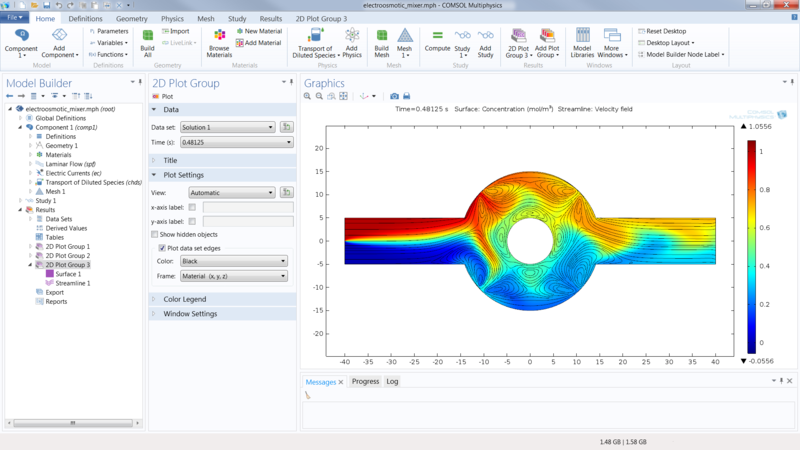 If you wish to drive COMSOL simulations by means of script programming, you can use MATLAB® and COMSOL together through the interface provided by the LiveLink™ for MATLAB®. With this LiveLink™, you can access all the functionality of the COMSOL Desktop® from a wealth of MATLAB commands. 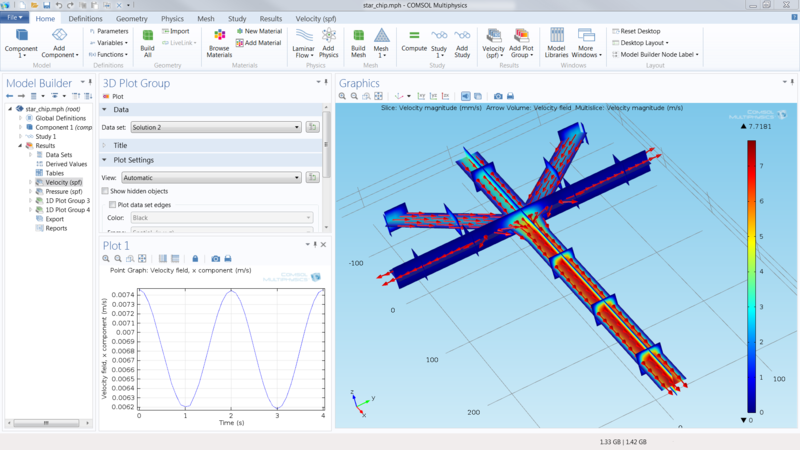 This provides a programmatic alternative to using the COMSOL Desktop® for microfluidics simulations. In this video, we simulate an electrokinetic valve. Using the Transport of Diluted Species, Creeping Flow, and Electric Currents interfaces, this video shows the complete analysis of a typical microfluidic valve design. This example is divided into two parts: the focusing stage (shown here) and the injection stage (shown in a follow-up video). During the focusing stage, an ionic sample solution and buffer solution are forced into two microchannels at a constant rate. Once a steady-state profile is reached, the device turns off the pressure-driven flow, completing the focusing stage. At this point, there is a focused concentration profile at the junction of the two microchannels called "the focusing zone". In the follow-up video, which shows the injection stage, electric currents are applied along the microchannels, driving ions from the focusing zone into the injection channel of the electrokinetic valve.